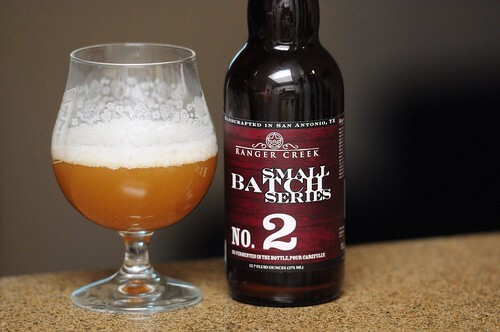 Small Batch Series No.2: Texas Farmhouse Ale, originally uploaded by adambarhan. A: Pours a murky, dark pale orange color. At first a massive white head forms, but recedes to a second to a ring. Not much lace is left behind after a few minutes. S: Light Belgian yeast, wood, spice, phenols. Mediocre. T: Spicy and phenolic yeast up front. Light fruity flavors, mostly citrus and lemon rind. Smoke could do with out not very well balanced. M/D: A medium body that is very effervescent. Crisp and dry, but way to thin for my liking. Not hard to drink. I will finish the bottle, but not something I will come back to. I found this pretty standard. Especially considering all that went into making this. Like most of Ranger Creeks latest offerings, needs work but better than the last one.